Every Friday, join PR Newswire media relations manager Amanda Hicken for a round up of five recent articles and blog posts that affect journalists, bloggers, and other content creators. A new American Press Institute poll revealed nearly four in 10 users did not trust news from social media. The American Press Institute polled 1,492 adults across the U.S. about their news consumption habits. Among the results released earlier this week, the study found that over a one-week period, 44 percent had gotten their news from a social media site. 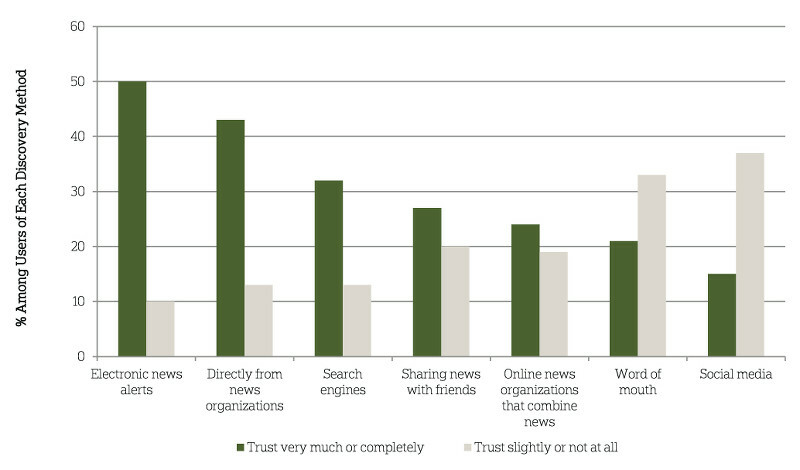 However, when asked about trustworthiness, four in 10 said they didn’t trust reports on social media. Which sources were considered the most trustworthy? Electronic news alerts and information directly from news organizations. The rise in data journalism has been a major trend among media outlets over the last couple of years. However, economist Allison Schrager argues that journalists need to be careful when using data in their stories. She says we all bring biases to our work that can taint how we analyze and present data. In an essay on Quartz, she presents the pitfalls for journalists and a set of ethics to avoid them. “The old system of pageviews and eyeballs are outdated,” said Jeff Jarvis, at the Guardian’s Changing Media Summit. The discussion at this week’s conference focused on the future of metrics. Media outlets are starting to look at repeat viewings and audience interest in a story and its updates to gauge a story’s success and forecast similar content. If you asked PR Newswire’s Grammar Hammer, she’d say that grammar matters a lot. Fellow grammar nut Jean Dion agrees to a point, but as she writes on Search Engine Journal, our collective focus on perfect writing may be “keeping some people out of our online conversations.” Her advice to would-be bloggers: Try to get the words right and use the available tools, but be brave and write. Write to Done has more advice for battling your writing demons. This post is especially helpful for freelancers and independent bloggers trying to build their career. It’s easy to get stuck, worrying about whether you’re ever going to be successful. But everyone faces rejection at some point; you need to choose to have perseverance and realize failure means nothing. What was the most interesting media news you read this week? Let us know in the comments. Amanda Hicken is a media relations manager with PR Newswire. Follow her at @ADHicken, where she tweets about the media, comic books, and her love of Cleveland.